As the author of a widely cited treatise on the False Claims Act, Ms. Sylvia is a thought leader in the qui tam bar. Her views on whistleblower laws are sought by federal and state legislators as well as the news media. She has had many successful cases against defense contractors and healthcare providers. Claire M. Sylvia, a partner at Phillips & Cohen, is the author of a leading treatise on the False Claims Act and has represented whistleblowers in many successful “qui tam” cases involving healthcare fraud and defense contractor fraud. 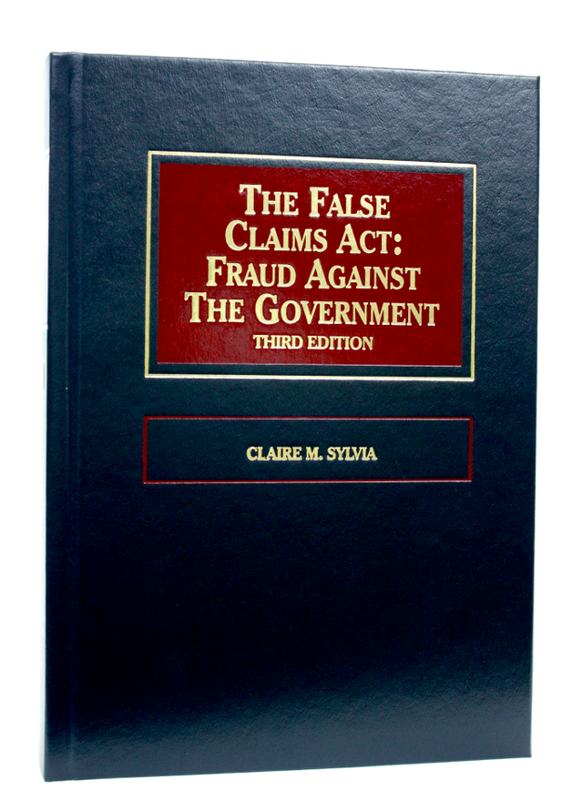 Her book, The False Claims Act: Fraud Against the Government (West 2016), has served as an important reference used by judges and attorneys in qui tam cases since it was first published in 2004. A whistleblower case against Alliant Techsystems (ATK) that settled for about $37 million. The settlement included the cost to retrofit 76,000 defective military flares that put military personnel at serious risk of death or injury if the flares were accidentally dropped while being handled or in transit. A qui tam case against Adventist Health that settled for $14.1 million. The lawsuit alleged Adventist Health violated the False Claims Act based on the underlying violations of the Stark Statute and the Anti-Kickback Statute. A whistleblower lawsuit against Northrop Grumman, which alleged Northrop had failed to test certain electronic components it sold the U.S. military for use in the navigation systems of planes, helicopters and submarines. Northrop paid $12.5 million to settle the case. A qui tam case against Rocky Mountain Instrument Co. (RMI) that broke new ground in the application of the False Claims Act. It apparently was the first time the False Claims Act was used in connection with violations of International Traffic in Arms Regulations (ITAR) and the Arms Control Export Act. Because of her expertise in the False Claims Act and qui tam cases, Ms. Sylvia has consulted with state officials on ways to create and effectively expand state whistleblower laws. She has provided testimony to Congress on Medicaid fraud enforcement and testified before the California Senate Judiciary Committee on the 2009 amendments to the California False Claims Act. Ms. Sylvia has co-authored several articles on the False Claims Act and “Practitioner Insight” articles on the False Claims Act published on WestlawNext. She has been an invited speaker at numerous conferences on whistleblower laws and Medicare fraud. Fighting fraud in government programs is a bipartisan issue. Along with fellow Phillips & Cohen partner Erika A. Kelton, Ms. Sylvia often teaches a course on whistleblower law at Berkeley Law at the University of California. The class was one of the first courses on the False Claims Act and whistleblower laws taught at a major law school. Ms. Sylvia joined Phillips & Cohen after 10 years with the San Francisco City Attorney’s Office, where she specialized in government ethics. Before working in the City Attorney’s Office, she was an assistant legal counsel in the Office of the U.S. Senate Legal Counsel. In that position, she represented Senate parties in litigation and advised Senate committees on legal matters related to investigations and other committee proceedings. Ms. Sylvia graduated from Harvard Law School. She was a member of the Harvard Law Review. Following graduation, she clerked for the Honorable Mariana Pfaelzer, in the U.S. District Court for the Central District of California. Ms. Sylvia is admitted to the bar in California. Hearing on Modernizing Stark Law to Ensure the Successful Transition from Volume to Value in the Medicare Program – House Ways and Means Health Subcommittee hearing – July 17, 2018 – Read Ms. Sylvia’s Testimony. Watch Ms. Sylvia’s testify about the importance of the Stark Law to protect patients and taxpayer dollars at a House subcommittee hearing below.